The Woodhaven Residents' Block Association would like to inform residents that state and federal agencies have sent inspectors to Woodhaven to conduct searches for the Asian long-horned beetle. The beetle is an invasive species that devastates trees. Official inspectors are going door-to-door, requesting access to the area around residences—especially backyards—to determine whether nearby vegetation is harboring any Asian long-horned beetles. Unfortunately, many residents have been unaware that the these surveys are taking place, leading them to be understandably suspicious of individuals seeking access to their property. 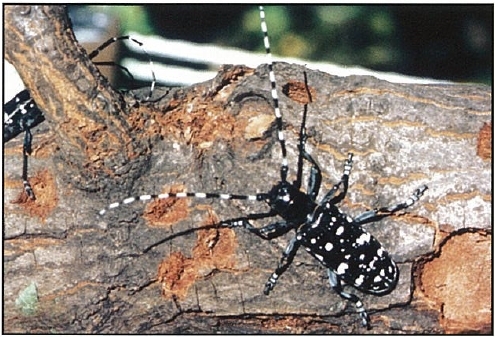 shows an Asian long-horned beetle. "These inspectors are doing important work to protect trees in Woodhaven and across Queens," said WRBA President Edward K. Wendell. "If someone claims they're from an official agency and asks for access to your property, request to see their identification and make sure they are dressed appropriately." There are two kinds of inspectors conducting the surveys: state and federal, the latter being from the U.S. Department of Agriculture (USDA). New York State inspectors do not have a uniform but should always be wearing an official orange vest with lettering. Federal inspectors should be dressed in either green pants or blue jeans, and should have on a black coat with USDA lettering. In all cases, inspectors have official badges and/or official IDs and will produce them on request. If, however, someone claiming to be an inspector does not produce identification, is not dressed properly, or does not properly identify themselves, do not grant them access to your property. Residents who feel uncomfortable or suspicious should call the police. The WRBA has received calls from residents who were concerned about purported inspectors. Some of this confusion arose from those personnel identifying themselves incorrectly or not wearing the proper attire. The WRBA has spoken with an inspection field manager and has expressed concern about some of the reports we have received. The Block Association hopes that the USDA takes steps to make sure that their inspectors properly identify themselves. The WRBA also hopes that improved openness and communication with residents will help inspectors keep Woodhaven free of this destructive pest. If they experience any problems with inspectors, residents should feel free to notify the WRBA at info@woodhaven-nyc.org or (718) 296-3735. Residents who suspect an Asian long-horned beetle infestation should collect an adult beetle in a jar, place the jar in a freezer, and immediately notify the USDA by calling (866) 265-0301.